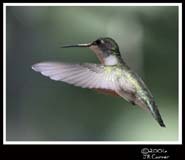 Hummingbird Index Page - Click any thumbnail below. 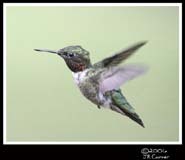 Ruby-throated Hummingbirds (Archilochus colubris) are native to North America. The males and females are very distinct in their coloring and textures. 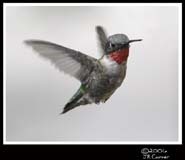 These pages show photographs of 5-6 different Hummers, some more colored, some more sleek, all of them moved very fast! These small wonders were very difficult to capture in the wild. They were shot with no flash, in natural light only. What you can see here are a few random selections from a much larger collection. Print sizes for these go up to 11"x14".